Chris Farlowe's first taste of real musical success occurred in 1957 while he was still John Deighton, and leader of the 'John Henry Skiffle Group'. Skiffle was then at its height and the group had won the All-England Skiffle Championship. However, the skiffle craze was replaced by the growing interest in Rock'n'Roll and the newly named Chris formed the Thunderbirds. With a voice that was already rounded and mature the new group with its R&B sound soon became a very popular musical attraction in London and they obtained residence at the Flamingo Club in Soho. Despite several attempts from 1962, none of his record releases had any great success until through his friendship with the group he obtained the song 'Out Of Time' from the Rolling Stones. With production by Mick Jagger, the record shot to the top of the UK chart. 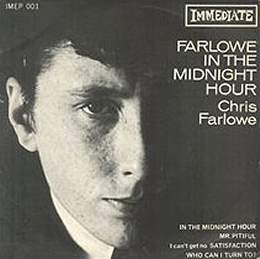 Several modest hits were to follow although Farlowe's vocal style was probably too far from the mainstream for most record buyers. All of Chris Farlowe's EP releases are very difficult to find. This one, which happens to be Immediate's first outing on that format (bearing the number IMEP 001), is perhaps a little easier to seek out than some others. The presence of a version of "(I Can't Get No) Satisfaction" perhaps exposes his association with the Rolling Stones. The Thunderbirds became a consistently popular R&B act despite frequent changes in personnel, although most of Chris Farlowe's recordings were done with session musicians. Despite the popularity of the group, Chris Farlowe changed his musical allegiances several times during the late 1960s and early 1970s. Perhaps this has prevented him from staying long enough in the public conscience to establish a niche. His magnificent voice should have given him greater success on record than he has enjoyed, but even to this day he remains a popular and respected stage act. Decca DFE8665 1965 "Chris Farlowe"
In The Midnight Hour/Mr. Pitiful/(I Can't Get No) Satisfaction/Who Can I Turn To? Immediate IMEP004 1966 "Chris Farlowe"
Island IEP709 1966 "Stormy Monday"